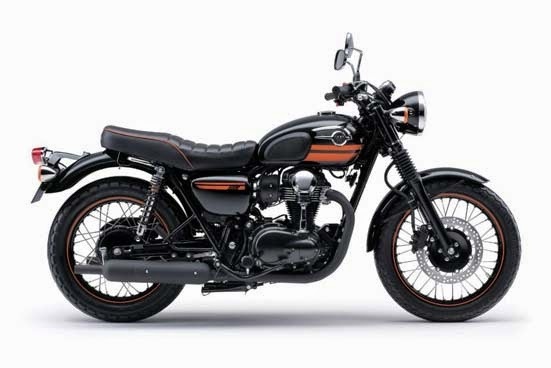 2014 Kawasaki W800 Special Edition Features and Specs - Dark and interesting, Kawasaki W800 Special Edition mixes matt and gloss black surfaces with black anodised style rims, detail features and subtle highlights into an intoxicating cocktail. 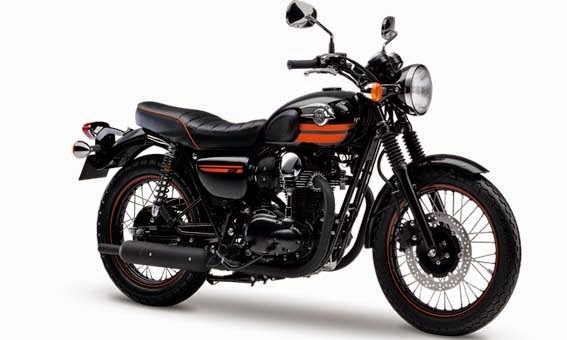 In terms of power, the Kawasaki W800 Special Edition boosts an air-cooled, 4-stroke vertical twin engine with a displacement of 773 cc. The unit generates a maximum power of 48 PS at 6,500 rpm and 60 Nm of torque at 2,500 rpm. All this power is kept under control by a five speed transmission with wet, multi-disc clutch. It is also worth mentioning that the motorcycle rides on 100/90-19M/C 57H front and 130/80-18M/C 66H rear tyres. The bike is priced at €8.569. Black engine parts : Contrast and compare. The W800 Special Edition shines thanks to an air-cooled black vertical twin engine and clever highlights. Iconic bevel-gear-driven cam adds classic beauty to the engine. Emblem on tank : The look of love. Every time you look down you can see the unique Kawasaki Special Edition logo. Matt black exhaust : Talk softly, but speak strong. Cool matt black exhausts sound good and add subtle streetwise character. Wheel rims : Black anodised style wheel rims, just one subtle way the W800 Special Edition stands apart from the crowd.